Home Politics Is Capriles following the Pope's advice? 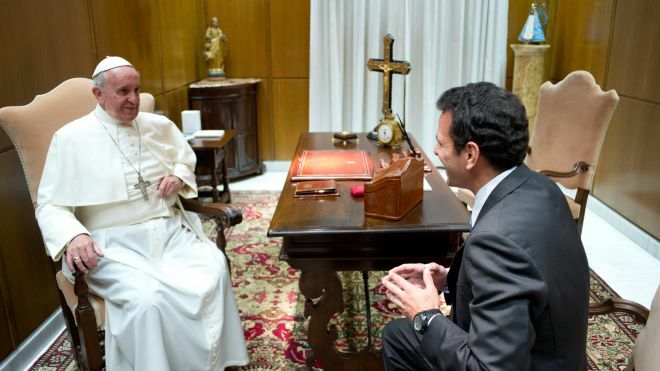 Is Capriles following the Pope's advice? When Henrique Capriles ran for President last April, he was so vicious we started calling him the “Miranda pitbull.” Gone were the days when he didn’t even mention his rivals. He went all out against Maduro, mocking and taunting him endlessly. In the immediate aftermath of the election, he continued with this tone. But, along the way, something happened, and the more moderate, conciliatory Capriles we have now began re-surfacing. My theory is that this was prodded by none other than His Holiness Pope Francis. These types of encounters should not be underestimated. Capriles has already shown a spiritual side, rare in Venezuelan politicians, that annoys the hell out of a lot of people. It’s part of who he is, I guess. So when pondering his current position, think back to that cold November morning in Rome, and consider the possibility that the strategy was fleshed out then. Some gentle prodding by St. Peter’s successor can go a long way in convincing a reluctant warrior to embrace his inner comeflor. Previous articleHey Quico: here's a steaming pile of words for you to eat.